The holiday is less than two weeks away, so now it’s finally time for all sane people to start caring about Christmas. To get you in the spirit we bring you Christmas videos from The Beatles, because nothing says “Christmas” better than the guys who were allegedly bigger than the guy the holiday is about. Above you see “Happy Crimble.” After the “read more” you’ll find a veritable Yuletime buttload of Beatles and Beatle-related Christmas videos. “Happy Crimble,” everyone! It’s a short PopCulteer this week as a minor case of pneumonia has infiltrated your loyal blogger. Yet, I have dragged myself from the sick bed to not only produce yet another episode of Radio Free Charleston, but to present this week’s delayed Monday Morning Art as the PopCulteer column. 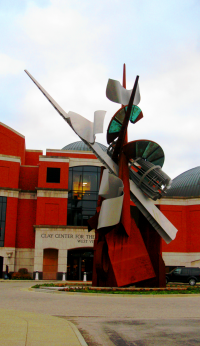 Last week I presented my critique of Albert Paley’s “Hallelujah” sculpture, which is now parked in front of The Clay Center, to the consternation of many patrons of the arts. 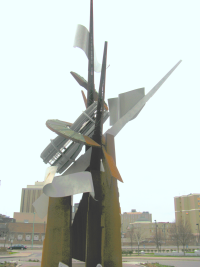 Because I hate to criticize without offering some sort of constructive criticism, I will now present four ideas I have for a large sculpture to go in front of The Clay Center, and I invite Mr. Paley to pick at, criticize and ridicule my suggestions, should he so wish. It’s not the most original idea, but I like the idea of huge arms protruding from the ground. In the final version of this, should any idle rich people be stupid enough to give me the cubic ton of money it would take for me to do it, the fingers would be more open, and less like a “howdy” wave, and the ground would look like it was bursting open. RFC 88: Who Let All Of This Riff Raff In The Room? We rushed out a special episode of Radio Free Charleston this week so we could beat the holiday rush. We’ve got great music from The Riff Raff Players and Flare Baroshi, plus we have the long-awaited trailer for Eamon Hardiman’s new movie, “Porkchop,” and some more DEVO-inspired animation from Frank Panucci. Our host segments were shot at Taylor Books, during a particularly cold and rainy winter night (actually, at the rate we’re going, this show will have gone online less than ten hours after our taping). If you don’t see the show at the top of this post, follow this link. Christmas is fast approaching, and we all know the true meaning of the holiday….cool toys! Today we’re going to look at some cool toy commercials from years past. Above you see a collection of spots from the early 1970s. Follow the jump for more classic toy commercials. It’s Big, But Is It Art? 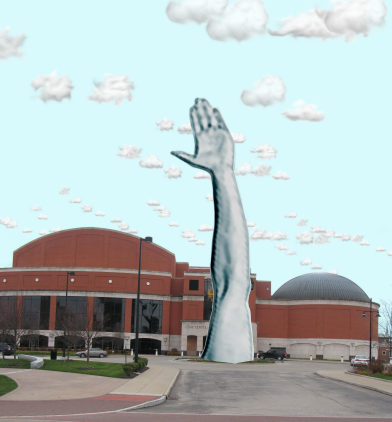 I’ve waited a few weeks to chime in on the controversial sculpture, “Hallelujah,” which was erected in front of the Clay Center in late summer. It’s certainly a provocative piece. Opinions tend to run from the very vocal people who hate it, to a few folks who, when pressed, will sheepishly admit that they sort of like it. I find myself in the middle. I like the idea of a big abstract outdoor piece in a prominent place in Charleston, and I like the piece itself, but I don’t think it really works in that location. John and Ruth McGee of Charleston donated the $900,000 sculpture, and they are to be commended for their generosity. Their choice of art might not be to your taste, but I didn’t see anyone else pony up 90o Grand to fill that empty spot in front of the Clay Center.